As far as I'm concerned, Sunday's opening of the Times Square pedestrian mall was a Grand Slam for New York City. We walked up there on Sunday to check it out and liked what we saw. The lawn chairs, people chilaxing, live bands performing, it all had a very airy, festive vibe. I will no longer dread all the overcrowded sidewalks filled with slow tourists walking three and four abreast. Indeed, I look forward to seeing what they do with it, and I hope it remains permanent. Now, if we could just get the High Line opened in the next few weeks. I did not expect to see that many people with lawn chairs. 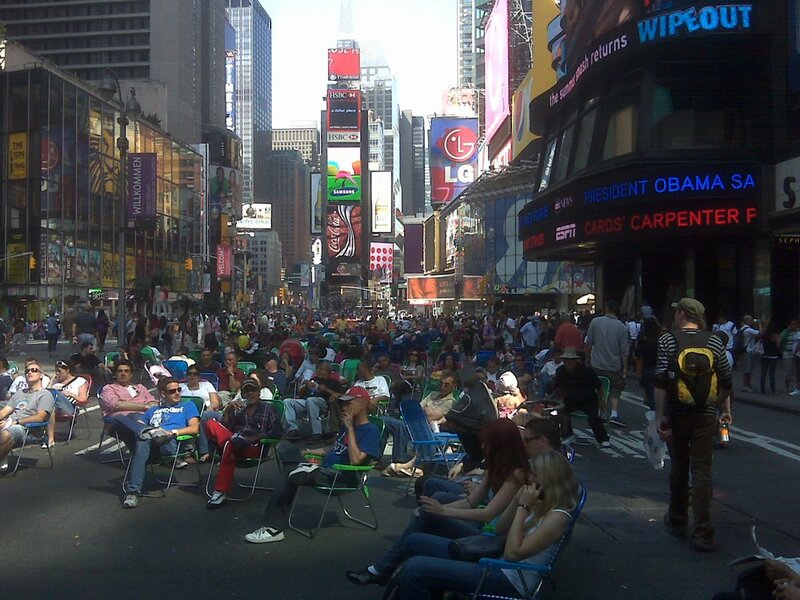 I guess I assumed since there is very little lawn in NYC, there would be no need for lawn chairs. It seems very midwestern to me.